Interview is the last hurdle a job seeker needs to cross. After several levels of tests, examinations and selection processes, a candidate is shortlisted to appear for the job interview. Candidates need to make a lasting impression on the interviewers to get the job. Many times, individuals who possess knowledge and skills lose out in the interview due to lack of personality or communication skills. These finer aspects also tend to contribute a lot in the job interviews. The success in a job interview depends on many different factors. You need to understand and prepare accordingly to get your dream job. 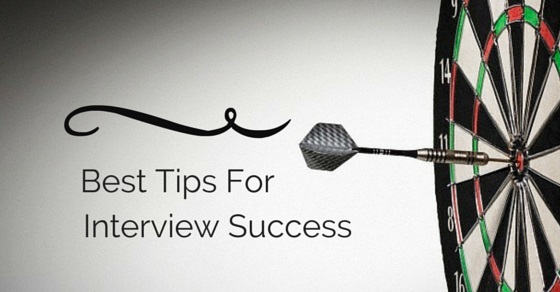 Here we have listed a few of the best tips for interview success. You need to have all the vital documents ready when you head for an interview. Carry a copy of all your school and college certificates when you go for the interview. You also need to carry a copy of the latest updated resume. You may seek professional assistance to create a proper resume. Make sure it includes all the extra curricular activities that you have participated in and all the events that you have organized while in college. You also need to carry 2 passport size photos when you head for the interview. Yes, there are several questions that are commonly asked during interviews. You need to prepare a list of these questions and prepare your answers for the same. You can research for the interview questions by checking out job portals and job related websites. You may even ask your seniors the kind of questions they had to answer during interviews. Here is a small list of the commonly asked questions during interviews. Where do you see yourself in the next 5 years ? What is your salary expectation and why? In some firms, the employers try to make you comfortable by starting off with questions like ‘tell me about yourself’. If you are asked such questions, take it as a golden opportunity. You must make use of this chance to tell them about your abilities, passion, superior knowledge and all other factors that make you an ideal candidate for the job you have chosen. Don’t waste time telling them about your family, friends and personal life. Finally, these are not things that bag you your job. Confidence is the key to success in any field. Overconfidence only spoils the show. You need to answer questions asked to you in a firm and confident tone. Overconfident individuals speak more than is required of them. They appear arrogant when they answer during interviews. You must thus be careful not to be more than confident. Always listen to the questions posed by the interviewers carefully, take time to think and then answer confidently. It is always a great idea to do a thorough research about the firm where you are appearing for an interview. Read through the firm’s success stories. Read about the visionaries who were responsible for the birth and growth of the firm. Try to understand the core principles of the firm. See whether you can adjust with the firm’s work ethics. Understanding the firm helps you give right answers during interviews. You tend to understand the firm better and know what the interviewers expect as answers to their questions. We often tend to neglect this aspect but what we wear makes an instant impression on the interviewer. You need to select the attire for the interview wisely. If you are applying for a technical profile or for a sales or marketing role, it is wise to opt for a formal light shirt and a proper formal trouser. Women may also wear formal skirts or other formal attires. You may be more casual with your attire if it is a creative role. Creative jobs are more open upon dressing and fashion. Punctuality counts a lot when you are heading for a job interview. When you reach on time for an interview, it shows that you are really serious about the job interview. People who reach late for interviews and do not even show the courtesy to inform beforehand lose the impression even before they make it. Wearing a watch on your wrist is a great idea. It creates an impression that you are time conscious. Many candidates prepare for an interview with just one employer and find the actual scenario to be different. The change shocks them and the candidate gets nervous. This ruins their entire job interview. It is thus better to be prepared for many different styles of job interviews. The most common form of job interview has rounds of interviews with the manager or the team lead and another round with the HR professional. You must also be mentally prepared to appear for group interviews. In these interviews, there will be one or two interviewers interviewing a bunch of candidates. You may be one of the candidates in the lot. In group interviews, you need to be prompt with your answers. As the interviewer shoots the question, you need to answer before someone else grabs the opportunity. The modern technology has made it possible to interview candidates in remote locations. These days the preliminary rounds of interviews do not require you to be at the location. You may have video or Skype interviews. In these interviews, you need to first ensure that your devices are working properly. It is better to have a mock video interview before starting the actual interview. A mock interview will help you get an idea how the actual one would be. Everyone tells you to go prepared for the most expected questions in interviews. But what if the interviewer comes up with some really strange question that does not even seem relevant to you? How would you tackle it? Yes, you need to be prepared for such questions too. Don’t sweat if you are asked ‘what do you think the government should do to make our country a developed nation?’. These are moments when you need to think on your fingertips and cook an answer on the spot. The beauty of unexpected questions is that no one comes prepared for them. If you answer something even close to sensible, you will impress your interviewers. So make sure you have an answer for all the questions you are asked. If you wish to succeed in interviews, you need to be well prepared. Each time you appear for a job interview, you get an idea what an interview is like and what you should expect. Wise candidates make a note of the questions that were asked to them during interviews. These notes prove extremely useful the next time they go for an interview. You also need to get in touch with the recruiters if they haven’t contacted you after the interview. You need to call them up and enquire. You should be mentally prepared for a rejection too. If they say you have not been selected, you need to ask them why. The reply to this question will help you understand your follies and amend yourself. It will help you clear your future interviews. Rejection is common in job interviews. You should not get demotivated by rejection. You must remember that there are countless candidates who appear for interviews each day and only a handful of them get selected. So you must accept rejection gracefully and start preparing for other job interviews. There are certain things that are not advisable during job interviews. These things need to be strictly avoided if you really wish for the job. Here we have listed a couple of these things. Tattoos are not advisable in the formal environment. You must avoid tattoos in areas where they are clearly visible. You may have tattoos if it is a creative job but usually it is not an ideal thing during job interviews. Any unusual body piercing may give you an informal appeal. You may opt for regular body piercing like the piercing of the ear. But you must strictly avoid piercing of tongue or chin while heading for job interviews. Avoid choosing funky or odd hair colours like blue, green or purple while heading for a job interview. You may choose natural shades like brown, red or black that do not stand out as odd during interviews. Funky hairstyles are not acceptable during job interviews. It is better to have simple, well cut and well combed hair when you head for a job interview. Clearing the interview and getting the job is a matter of luck but better preparation surely contributes to your luck.